This is Part 2 of Making objects glow Blender 3D tutorial. Before we go into the Node Editor, we will firstly need to define and create the 2 Render Layers as described in Part 1. They are namely: ‘Glows’ & ‘Base’. Firstly, assign all the glowing objects and lights onto a layer that is separated from the rest of the scene objects. The lights goes into this layer so that when this layer is rendered, the glow objects do not appear as black stuffs due to the lack of illumination. 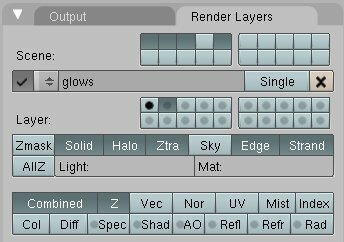 If your glowing objects and lights are not already on a separate layer, shift-select all of them. Next, press ‘M’ key and assign them onto an empty layer. In this tutorial example, it is in layer 2. Now, we can go on to create the 2 render layers. To do that, go to the Scene (F10) panel. Click on the Render Layers Tab. Rename ‘1 render layer’ as ‘base’. This is as shown below. Once the ‘Base’ render layer has been created, we move on to create the ‘Glows’ Layer. To add a new layer, click on the up-down arrow button as shown below. Go to Add New and create a new layer call ‘glows’. Under the layer section, turn on the layer where all the glowing objects are in. In this example, it is in layer 2. Turn off all other layers. Next, press Ctrl button and click on the first layer button. A black dot will appear in the 1st layer button. This signifies that a layer mask has been created in layer 1. The purpose of the layer mask is to block off parts of the glowing objects that should not be included for glowing. Next, for the ‘Glows’ layer, the Sky must be de-activated. This is an important and often overlooked point. The creation and modification of the ‘Glows’ layer is as shown below. 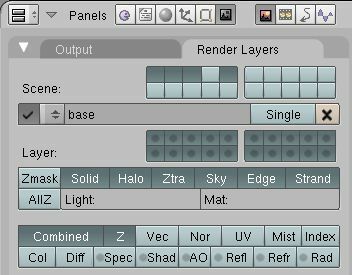 Once the 2 render layers have been created, we can go to the Node Editor to add and edit the necessary nodes configurations. This is the end of Part 2 of the Blender glow tutorial. I am a teacher from Yishun Junior College in charge of Media Club. Animation is one of the acitivity in my club. I would like to invite you to talk to my students on a wednesday afternoon for one or 2 hours about your work in this field. I would also love to visit La Salle if possible. You can also suggest an activity that may be suitable for a group of 20 students. Your reply and suggestion will be appreciated. Thank you.